Afiŝo de The Prince and the Showgirl. Marilyn Monroe kaj Laurence Olivier. 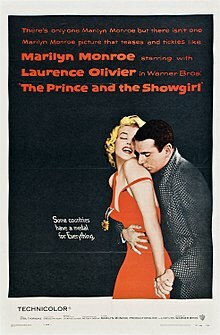 The Prince and the Showgirl (La princo kaj la kabaredistino) estas brit-usona amafera komedia filmo de 1957 en kiu stelulas Marilyn Monroe kaj Laurence Olivier. Olivier estis ankaŭ reĝisoro kaj produktoro. La scenaro de Terence Rattigan estis bazita sur lia teatraĵo de 1953 nome The Sleeping Prince. Ĝi estis filmita en Londono. La intrigo okazas en Londono en Junio de 1911. Dum kunsido de reĝfamiliaj personoj por nupto, la Princo Regento de fikcia Karpatio konatiĝas kun bela kantistino kies rolulon ludas Marilyn Monroe. ↑ Bosley Crowther (1957)The Prince and the Showgirl. The New York Times. Ĉi tiu paĝo estis lastafoje redaktita je 22:07, 8 okt. 2015.